Share Your Ideas and Get A Free Template! 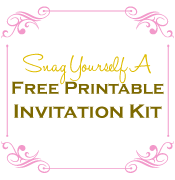 Who wouldn't want free invitation templates? So what do you gotta do to get one? Inspire me! Share your ideas for an upcoming brand new invitation template and party kit. Maybe you have a specific event that you need an invitation for? Maybe you simply have grand ideas for unique and fresh invitations and wedding stationery! Whatever the case may be, If I decide to use your idea I will send you a free copy of the entire invitations and party kit for FREE! So fill in the forms below to share your ideas and drop me an email. I look forward to hearing all of your unique ideas! What Kind Of Ideas Am I Looking For? Just throw all of your ideas at me and I will run with them! You know that invite that you keep picturing in your head but cannot find anywhere? I want to be the one to create that invitation!